Explore the southwest region of Tasmania in this five-day adventure. Starting out in Hobart, this itinerary takes you to the quaint town of New Norfolk, with its historic buildings, to Strahan, known for its crayfish and proximity to Sarah Island. 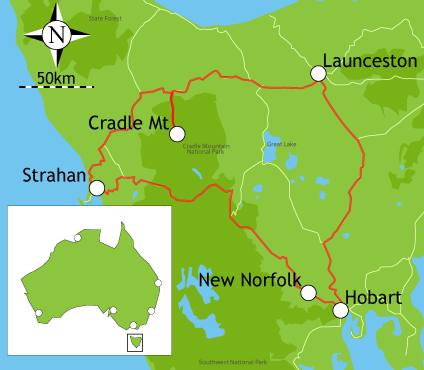 From Strahan you're off to Cradle Mountain-Lake St. Clair National Park, with walking tracks for every ability, and then to Launceston, where you can shop, visit historic sites, and relax with a glass of locally grown wine. The final stop on your trip takes you back to Hobart to explore the galleries, shops, restaurants, and historic sites of the city's famous waterfront. The first leg of your trip is a short one, 36 km north-west (about 40 minutes) up the Brooker and Lyell Highways to the Derwent Valley region. Located on the Derwent River, New Norfolk is considered 'Tasmania's best kept secret.' Founded in 1808 by settlers from Norfolk Island, New Norfolk is a town rich in history. Here you can see the oldest continuously run inn, the oldest Anglican Church, and other historic homes and sites. The grave of Betty King, the first white woman to set foot on Australian soil, is located in Magra not far from New Norfolk. Take a drive up to Pulpit Rock Lookout for great views of the river, and then dine out at Tynwald, a historic mansion built in 1830. A working oast house for more than one hundred years (until 1969) the Oast House is now a museum, gift shop and craft market, and tea room. Learn how hops from the nearby fields were farmed and processed. Today, drive 254 km north-west (about 3 hours) via the Lyell Highway to the west coast of Tasmania. Strahan, a working fishing port located on the Macquarie Harbour, was a wild town in pioneer days. Little of that rough and tumble time is evident as you walk down the main street, the Esplanade, peeking in shops and indulging in the catch of the day. Spectacular wildlife can be found in and around Strahan, from Ocean Beach, Tasmania's longest beach at 33 km, to the Gordon-Franklin Wild Rivers National Park, to the Henty Sand Dunes. Located a short walk to the village of Strahan and 150 meters from West Strahan Beach, this park is situated on 4 lush acres and features a wandering creek throughout the property. The park offers guests laundry facilities and a BBQ area, and is close to a swimming beach, children's park, jetty and boat ramp, and general store. Accommodations include full self-contained family cabins and budget onsite units. Along this 35 km journey back in time, you will hear stories about the pioneers who built the railway, stop at several stations for lunch and refreshments, and enjoy the magnificent views of rainforests, rivers and gorges. After five hours aboard the traditional steam locomotives, you arrive in Queenstown and are shuttled back to Strahan. If you are living large on this trip, book a seat in the Premier Carriage, where you can indulge in delicacies served by an attendant. Indulge in the local seafood, especially West Coast lobsters (Tasmanian crayfish), Atlantic salmon and ocean trout. Try Macquarie Restaurant on the hill for a buffet and great views, or the century-old Franklin Manor for the best in upscale dining. Or, just make your way to the Esplanade and find the restaurant with the best specials! Drive 146 km north and east (about 2 hours) via Henty Road, Zeehan and Murchison Highways, and Cradle Mountain Development Road to the beautiful Cradle Mountain-Lake St. Clair National Park. Known worldwide for it's six-day bushwalk, the Overland Track, this magnificent park boasts countless natural wonders. Set out on your own, or take a guided tour on foot, in a canoe, or 4WD. Guided fishing tours are also available. Plan to spend 2 days here in Cradle Mountain, especially if you love the outdoors. If you prefer to wander through galleries, shops, and dining out, spend 2 days at your next stop, in Launceston. Both stops are worth more than one day. Located near the entrance to the Lake St. Clair National Park entrance to Cradle Mountain, and features two large camp kitchens, outdoor BBQ areas, open log fires, shops with extensive provisions, a disabled-friendly, environmentally safe ablution block, laundry facilities, wilderness walks, and an information center. Choose from self-contained cabins, deluxe cottages, spa cottages, backpacker hostel, powered caravan sites, campsites, and alpine mini huts. Just because you are enjoying a campervan adventure, does not mean you can't indulge in a little four-star pampering! Book a massage, facial, or other spa treatment for a reward after a long day of walking. For those who would rather sit back and enjoy the view, the Historic Park Drive is an excellent way to see and learn about the park. Your guide will go over the history and highlights of the park, and a Devonshire Tea will be served at Waldheim, a historic section of the park. Tours leave from the Cradle Mountain Chateau. Your drive today takes you 144 km east (about two hours) to Launceston, via a series of roads including Cradle Mountain Road and the Bass Highway. Located at the center of it all, Launceston is a big change from Cradle Mountain, with an abundance of Victorian and Colonial architecture, arts and culture, and varied attractions. Within the 'Valley of the Senses' you will find vineyards, the famous Boag's Brewery, and amazing dining experiences. Located just north of Launceston, this award-winning park is situated on eight park-like acres and features a fully equipped amenities block, children's playground, covered BBQ area, tennis court, disabled showers and toilets, laundry facilities, and carwash facilities. Choose from deluxe spa cabins, premium cabins, self-contained park and budget cabins, on-site caravans, powered sites and camping sites. Located 2 km from the center of Launceston, this park is situated on three hectares of former parkland, and features three amenities blocks, laundry facilities, free BBQs, tour booking assistance, camper's kitchen with TV, car washing facilities, and a bathroom for babies. Choose from full self-contained deluxe and standard cabins, and onsite caravans, as well as powered caravan and campervan sites, and camping sites. A short walk from the city center, the Cataract Gorge is a fun attraction for families. Victoria gardens, walking trails, lookouts, a swimming pool, caf' and restaurant enable everyone in your group to find something they enjoy. Take a ride on the longest single span chairlift in the world! Located on the banks of the Derwent River ten minutes from Hobart, this park features a children's playground, laundry facilities, BBQ area, three amenities blocks, and a camper's kitchen. Choose from self-contained holiday cabins, ensuite caravans, powered caravan and campervan sites and foreshore camping sites. Walk straight down Main Street to Hobart's bustling waterfront. Start out at Salamanca Place, the preferred hangout of 19th century mariners, where you will find sandstone warehouses converted into shops, and the famed Saturday Market. Here you will also find Kelly's Steps, the gateway to the Battery Point suburb; the Tasmanian Museum and Art Gallery is nearby. For more shops, crafts, and galleries, head to Gasworks Village, home of Australia's only commercial whisky distillery. Get your seafood fix on Constitution Dock, and then stop in one of the pubs.